LONDON, ON – The London Free Press reports that Flying Monkeys Craft Brewery in Barrie has started brewing a beer to be served exclusively at Windermere Manor, a hotel located near the University of Western Ontario in London. 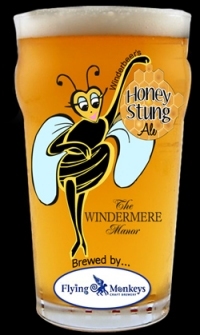 Honey Stung Ale is made using honey from the 23 beehives located at Windermere. The hotel uses the honey in their kitchen, gives small bottles to guests, and sells it, so it was a logical pairing to have it used in their house beer. Honey Stung Ale is available now at Windermere Manor for $6.50 a pint, with branded glassware also available for purchase.